IMAGE: Hans Feibusch, “The Magi”. We were invited by Hyde Housing to view a 1940 mural in St Wilfrid’s by Hans Feibusch, a German/ Jewish painter who, like many other artists, came to England in 1933 fleeing from Nazi persecution. The church was designed by Harry Stuart Goodhart-Rendell in a semi-modern eclectic style. It was built between 1932-1933 and John Betjeman called it “about the best 1930s church there is”. It fell into disuse in the 1980s and was subsequently listed to save it from demolition. It was converted into flats for elderly people in the 1990s and bought by Hyde Housing. Parts of the original church still remain more or less intact, including the chancel and the Lady Chapel. The latter contains the Feibusch mural. Besides its obvious quality, we were taken aback by the sheer size and scale of it. It occupies three of the four walls and is representational, painted in a rather Expressionist style, typical of the time. 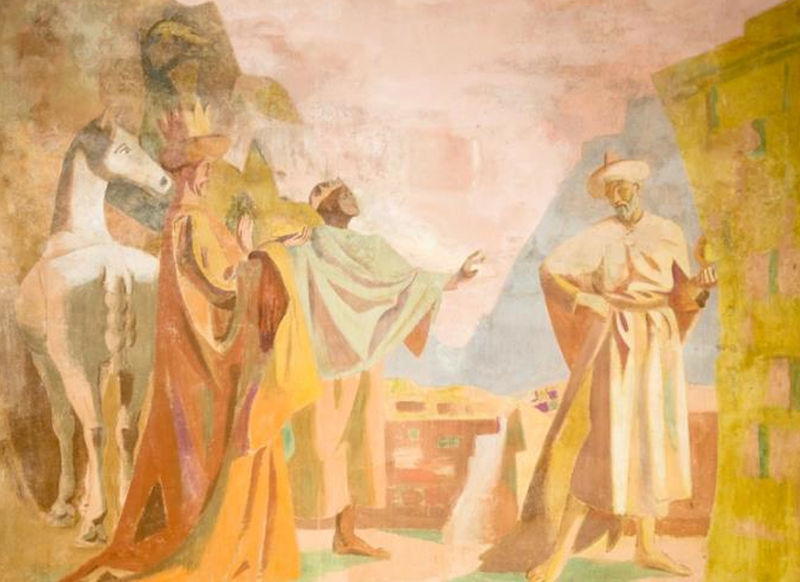 Interestingly for Brighton Society members, Robert Gregory, who was our Chairman for many years, attended the church as a boy and was the model for one of the figures in the mural. We will be talking to Robert – who is now well into his nineties – and hope to be able to discover more about the background to the mural from him. Feibusch was an important artist. Besides St Wilfrid’s, he painted about 40 murals in churches all over the country, and the Pallant Gallery in Chichester has the contents of his studio, which he used from the 1930s until he stopped painting in 1997 – one year before he died, aged 99. Brighton Society member Sarah Tobias has written a paper on St Wilfrid’s church and Feibusch the artist, which will shortly be posted on our website. She also acted as a tour guide during the Heritage Open Day event last month. About 70 people viewed the mural – the first time it has been on public view for almost 40 years. Unfortunately access to the mural – and the original parts of the church – is difficult to arrange as it can only be gained by passing through private areas of the residential accommodation. Hyde are keen to improve the access arrangements so that the mural can be opened up to regular public view – but this will require substantial building alterations. They approached us to ask whether we could assist in publicising the mural in order to help with raising the funds to carry out the work.